First off the authors state that decisions sciences do not relate to EBM. They feel decisions are personal and statistical information is not important. They give the example of organ transplantation. Unfortunately, they skip an important step in their argument. Namely, that to know an organ transplant will be of benefit is based upon studies proving that they prolong life and these are based on statistical information. They argue that EBM is based on a statistical blunder: the ecological fallacy. There is some merit to this argument. The average finding applies to the average patient. What if your patient isn’t average. There are a couple of options. First, you could calculate your patient’s estimate of benefit (or risk) using the results from the study like I demonstrate in this video. Almost every study report will include a confidence interval around the point estimate of benefit (or harm). The point estimate is the best guess about the findings of the study but there is uncertainty and the confidence interval helps quantify that uncertainty. You could use the upper and lower bounds of the confidence interval and decide if it includes a clinically important benefit. Finally, you could look for a subgroup analysis (yes I recognize the limitations of this) of a group of patients similar to yours. Despite all this, science is based on inference. We can never measure the effect of an intervention in all people. We often use inductive and deductive reasoning in science. The authors spent several pages discussing pattern recognition in medicine and that EBM doesn’t help this. This is both true and false. It is true in that we are taught how certain things look and there will never be a study related to that. We have numerous studies though of how good elements of the history and PE are for diagnosing disease. Many of these are pattern recognition. We learn that peripheral edema, orthopnea, PND, and DOE are most likely congestive heart failure. That is pattern recognition but there is also a study that examines how good each of these components is to increasing or decreasing the probability of CHF. Thus, pattern recognition is informed by EBM. There are more claims to be refuted in this chapter but these are the main ones worth refuting. This is going to be a lot harder than I thought. I question why I am even wasting my time reading this tripe but I will plod forward so that there is a counterargument to this work. I also need to understand criticisms of this paradigm so that the paradigm can be improved. Importantly, the authors focus on an outdated definition of EBM. This definition was the first iteration of the definition and is oft-quoted but it is out of date nonetheless. 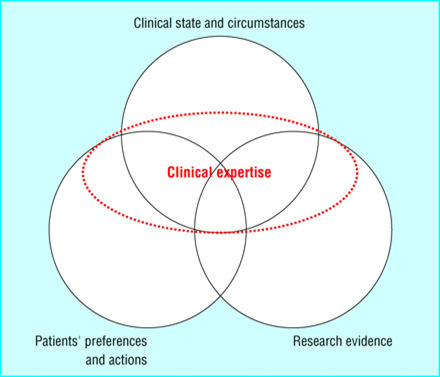 Evidence based medicine (EBM) is the conscientious, explicit, judicious use of the current, best evidence in making decisions about the care of individual patients. The current paradigm of EBM was published in 2002 well before this book was published and should have been included in this book. Hickey and Roberts claim it had its origins in the legal system which is total BS. If you read the early EBM papers there is no mention of the legal system driving this paradigm. I also consider EBM to just be a set of skills (searching, critical appraisal, application) to use in the care of patients. They focus and have problems with 2 words in the above definition: best and evidence. They are concerned that best leads to selection of evidence and that “one bit of evidence is better than another”. Of course some evidence is better than others. Empirical studies (not done by the evil drug companies) have demonstrated that certain design flaws, for example lack of blinding, lead to overestimation of effects. Studies have also demonstrated that observational study designs can overestimate effects and even give opposite effects to randomized trials (see the HRT saga). I’m sure they will argue later in the book that all these types of studies are rigged and randomized trials are rigged (probably because their holy grail, Vitamin C, failed in controlled trials to be useful). There are too many studies showing similar effects to discount the evidence that supports the fact that some studies are better than others. They claim “EBM’s evidence does not mean scientific information or data, but refers to legal justification“. First off, EBM does not possess evidence so the ‘ is misplaced. Second, this statement doesn’t even possess any face validity. Journals are full of scientific information and data. What are they talking about? They claim “EBM has little to offer the doctor treating a patient, beyond suggestions about what might be expected with an average patient“. Studies used to inform practice usually are based on a sampling of patients because we can’t study every single person with that problem. Sampling can be done to reflect a broad range of people with a given problem or it can be done to select for certain subpopulations of disease (for example, advanced disease or early disease). On average, most people are average. So their statement isn’t totally without merit. We can’t do studies on every type of patient. But, here is where the current paradigm helps us. We (as doctors) take into account the patient’s state and circumstances when applying the best available evidence to their case. We use our clinical training and experience to decide what we should do from what we could do. There are ways to adapt study data to an individual patient like I demonstrate in this video. N-of-1 trials can also be done on individual patients to see if a therapy is effective (more on this in another post). Unfortunately, a lot has been going on in life and I haven’t posted as much as I would like to. The main reason has been some major life changes and class work (I’m getting a master in educational technology). Another reason has been a lack of inspiration. Well, I am inspired now. Recently on a listserv I subscribe to someone mentioned a book called Tarnished Gold: The Sickness of Evidence-based Medicine. Some said it was a great book and many said it was garbage. I had never heard of it but could tell by the comments it is an anti-EBM piece. The EBM paradigm is evolving, as it should. Part of how a paradigm evolves is critical review of its tenants. This book seems to challenge the tenants of EBM. It’s important to look at all sides of a story to formulate a complete understanding of it. My bias is for EBM principles. I plan to read this book and give my rebuttal to each chapter. I will be as fair as I can and give them credit for good ideas and challenge ones I don’t agree with. I have read the preface, foreword, and 1st chapter and know I will have a lot to write about. Look for my 1st installment tomorrow. With all the discussion of EBM in crisis and EBM on trial it strikes me that maybe these other folks have a different definition or concept of EBM than I do. I think to have any discussion needs to come from a common ground of just what is EBM. This definition is more explicit about the order of importance of the individual elements of the components of EBM: patient preferences and actions is foremost, followed by the clinical state and circumstances and the research evidence. All this is tempered or tied together by our clinical expertise. The evidence tells us what could be done while the rest tells us what should be done. So from this background I find it difficult to lay blame on EBM for many of the problems with the evidence. I blogged on this previously and will refute their claims at EvidenceLive2015 in April. Will EBM be found guilty or not guilty? Carl Heneghan recently wrote a blog for BMJ blogs entitled Evidence based medicine on trial focusing mostly on the problem with the evidence part of EBM. While I mostly concur with his list of the problems (distortion of the research agenda, very poor quality research, and lack of transparency for published evidence) I wonder who is at fault. “EBM” seems to get the blame as if there is an entity that is EBM and it controls all research. EBM is but a set of skills: question asking, searching, critical appraisal, and application to individual patients. It is nothing more. So why are people being so critical and place so much blame on a set of skills? There will be several sessions at EvidenceLive 2015 (one of which I will be speaking at in defense of EBM) on real vs rubbish EBM. I want to focus on the distortion of the research agenda. Professor Heneghan rightly points out that the research agenda is driven by industry. Is that good or bad? I think its both but mostly good. The only other major funders of research are governmental agencies like the NIH. Profit drives innovation. It is very expensive to bring a drug to market. The government could not afford to bring the current drugs we have and need to market. One failed drug alone would deplete the coffers. Failure is the biggest driver of cost. Fewer than 1 in 10 drugs tested makes it to market. Would we tolerate that poor of a success rate at such a big cost by the government? No. …adjusting that estimate for current failure rates results in an estimate of $4 billion in research dollars spent for every drug that is approved. I agree that industry seems at times to make a drug then find a “disease” for it. I think the example Professor Heneghan gives is spot on. I don’t believe in adult ADHD but we have drugs for it. Do we need them? No and this video demonstrates why: Drug free treatment of ADHD. Who is really at fault are the doctors who prescribe the drugs that Professor Heneghan feels aren’t necessary. Not the companies for making them. On a serious note…what about all the devices we use regularly like stents, defibrillators, etc? Would government have independently brought these to market? Likely not. We had balloon angioplasty (without stenting) that worked just fine albeit short term only. It would have been “good enough for government work” as the saying goes. What about advancements in imaging modalities? Again likely not. The old CT scanners worked just fine. Industry is largely responsible for innovation and improvement in all walks of life. Yes for a profit but profit is not a bad thing. Those who say otherwise please return your iPhones. I’ve left the hardest issue to deal with for last- “Overemphasis on following algorithmic rules”. This has been the most frustrating aspect of my primary care practice. Patients quit being viewed as patients but a set of goals that I had to achieve to be smiled upon fondly by my boss as being “a good doctor”. It took me some time to finally quit playing the game and just do the best I could do and whatever the numbers were so be it. Algorithmic medicine couldn’t be any more antithetical to EBM. Everyone is viewed the same. EBM clearly, as I have argued in the last three posts, is about individual patient values and circumstances. It’s about clinical experience temporizing what we could do to what we should do. Algorithmic medicine allows no individuality. No temporizing. Thus to claim EBM is in crisis because of algorithmic medicine is wrong. True EBM protects us from the harms of algorithmic medicine. Interestingly computerized decision support systems (mentioned as a culprit in the first sentence of this section of Greenhalgh’s paper) are at the top of Haynes’ 6S hierarchy of preappraised evidence. At the VA we have a moderately sophisticated CDSS. It warns me if my patient with heart failure is not taking an ACE inhibitor and its smart enough that if I enter an allergy to ACE inhibitors it won’t prompt me to order one. If I tell it that a patient has limited life expectancy it will not prompt me to pursue certain routine health screenings. Thus, I don’t view CDSSs as problematic in and of themselves. The problem arises when physicians don’t consider the whole patient (remember those values and clinical circumstances) in deciding whether or not to follow prompted recommendations. “EBM principles are not in crisis, but corruption of healthcare has oft hidden behind the e-b moniker. EBM helps uncover it“.